As always, my many thanks to the publisher and to LibraryThing early reviewers for my copy. How to Get Filthy Rich in Rising Asia is a story that charts the story of a man's rise in the world, countered by his losses, and it is also a story of love, although you might not guess that based on the title. Nor would you believe it when you open the first page and find yourself reading about the nature of self-help books. In fact, you might be wondering just what the author is doing as you get more into the novel, because there are no character names, there is no name for the country in which all of the action is taking place, and the main character is addressed only as "You." I first became interested in this novel last fall, when it was briefly excerpted in the New Yorker, and it whetted my appetite for more. For me, there were no disappointments -- I loved this book, and I recommend it highly. "...if you truly want to become filthy rich in rising Asia, as we appear to have established that you do, then sooner or later you must work for yourself. The fruits of labor are delicious, but individually they're not particularly fattening. So don't share yours, and munch on those of others when you can." It is ultimately and perhaps ironically water that launches "you" into the world of bureaucrat patronage, big business, and wealth as he starts a business bottling it. First it comes from the tap, despite cracking pipes, underground mains contaminated with sewage that causes deadly diseases; the "well-off" citizens of this city have turned to bottled water as a result. At first, the unnamed protagonist has a small operation, boiling tap water before bottling it; he eventually moves on to becoming a water entrepreneur and making lots of money. The big jobs that will bring him fame and the potential for more riches are dangling in front of him, for example, an exclusive housing developments in the city, "marketed, developed, and administered by one of a comprehensive network of military-related corporations," where the newest phase will have its own electricity plant and its own drinkable water, "Like you've gone to Europe. Or North America... without leaving home," ... "an inspiration for the entire country." By now the city's aquifer is slowly being depleted, but "you" has become a rich man. The use of the self-help format separates different periods of "you's" life and his material rise to entrepreneur under chapter headings that seem to be commonsensical and offer sound advice, for example, "Work for Yourself," "Befriend a Bureaucrat," or even "Be Prepared to Use Violence." It also brings to light that while riches can be achieved, and success can be realized, there's also a flip side: loss. While "You" is steadily climbing the success ladder, his losses begin to mount: his marriage and relationship with his son are slowly disintegrating, and as he gets older, health and fortune begin to wane. While the story focuses on this character, the format of this book also allows the reader to project his story onto this unnamed country, and the growing pains it endures: health concerns, the mass move to the cities that changes traditional family structures and family dynamics, and among other things, leads to the construction of haphazard housing that as the author notes, probably wouldn't survive torrential rainstorms or earthquakes. Rapid growth and one's financial successes are caught up in webs of corruption, nepotism and graft that are inherent in every stage of the process (even "you's" elementary school teacher got his job through bribes and family connections in the bureaucracy); physical security comes from having a bodyguard prepared to shoot your rivals' hitmen or anyone else who might want you out of the way; then, of course, there are the ever-present environmental concerns that are pretty much ignored. The book as a whole also provides a framework for trying to understand a part of the world that most of us actually know very little about. As I came to the end of the novel, one of the questions I took away with me was whether or not the unnamed protagonist's successes were worth the inevitable losses -- extending that concept outward I find myself hoping that this country will survive the downsides of its attempts at its own rise in the world. The powerful and continuing love story between the unnamed character and the pretty girl holds the key to existing with a measure of peace and stability among the chaos; that's all I'll say about this right now and leave it to you to read it for yourself. The book as a whole also provides a framework for trying to understand a part of the world that most of us actually know very little about. 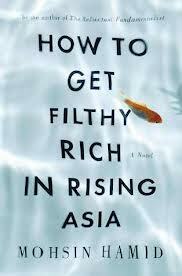 I loved this book; all in all, I found How to Get Filthy Rich in Rising Asia to be a very clever, well-written and thought-provoking novel. There is so much more to this book than I can encapsulate in a few paragraphs here, which is okay, because the book is really best experienced via one's own imagination.